Zur Anleitung DROPS 157-15 im Original. Von oben nach unten gestrickter DROPS Poncho und Stirnband in „Alaska“ mit Zöpfen. Größe S-XXXL. DROPS RUNDNADEL (60 und 80 cm) NR. 5 – oder die benötigte Nadelstärke, um folgende Maschenprobe zu erhalten: 17 M x 22 R glatt re = 10 x 10 cm. DROPS RUNDNADEL (60 und 80 cm) NR. 4 – für das Rippenmuster. DROPS NADEL NR. 5 – oder die benötigte Nadelstärke, um folgende Maschenprobe zu erhalten: 17 M x 22 R glatt re = 10 x 10 cm. Sie können das für diese Anleitung benötigte Garn ab	16.28€ erhalten. Erfahren Sie mehr. Siehe Diagramm A.1-A.2. Das Diagramm zeigt alle Rd., wie sie auf der Vorderseite erscheinen bzw. das Diagramm zeigt die Hin- und Rück-R, wie sie auf der Vorderseite erscheinen. 1 M zunehmen, indem man einen Umschlag macht. In der nächsten Rd wird der Umschlag re verschränkt gestrickt (d.h. man strickt in das hintere Maschenglied statt in das vordere), damit kein Loch entsteht. Die Arbeit wird auf einer Rundnadel von oben nach unten rund gestrickt. 132-138-144 M mit Rundnadel 4 mit Alaska anschlagen. 1 Rd re stricken. Dann im Rippenmuster stricken (= 3 re /3 li). Nach 10 cm 1 Krausrippe stricken – siehe oben – dabei GLEICHZEITIG gleichmäßig verteilt in der ersten Rd 18-24-28 M zun = 150-162-172 M. Zu Rundnadel 5 wechseln. BEACHTEN SIE DIE MASCHENPROBE! Die Runde beginnt nun auf der einen Seite der Arb. * 9-11-11 re, 1 li, 3 re, 1 li, 1-2-2 re, 1 li, A.1 (= 3 M), 2 li, A.2 (= 13 M), ** 2 li, A.1 **, von **-** noch 0-0 1 x wdh, 2 li, A.2, 2 li, A.1, 1 li, 1-2-2 re, 1 li, 3 re, 1 li, 9-11-11 re*, von * - * noch 1 x wdh. GLEICHZEITIG auf beiden Seiten aller «1 li, 3 re, 1 li» 1 M zunehmen – SIEHE TIPP ZUR ZUNAHME = 8 M zugenommen. Die zugenommenen Maschen werden rechts gestrickt. Wiederholen Sie diese Zunahmen in jeder 3.Runde insgesamt 16-17-17 x = 278-298-308 M. Im Muster weiterstricken. Nach 41-43-45 cm zu Rundnadel 4 wechseln und 1 Krausrippe über alle M str, dabei GLEICHZEITIG gleichmäßig verteilt 4-2-4 M zunehmen = 282-300-312 M. Dann im Rippenmuster (3 re/3 li) bis zu einer Gesamthöhe von 45-47-49 cm str. Die Maschen abketten, wie sie erscheinen (rechte Maschen rechts abketten und linke Maschen links abketten). Die Arbeit wird in Hin- und Rück-R gestrickt. 23 M mit Nadel 5 mit Alaska anschlagen. 1 Krausrippe stricken – siehe oben, dabei GLEICHZEITIG in der letzten R gleichmäßig verteilt 6 M zunehmen = 29 M. Dann wird die nächste Hin-R wie folgt gestrickt: 2 re, 1 li, A.1 (= 3 M), 2 li, A.2 (= 13 M), 2 li, A.1, 1 li, 2 re. Im Muster weiterstricken - BEACHTEN SIE DIE MASCHENPROBE! Nach 47 cm 1 Krausrippe über alle M stricken, dabei GLEICHZEITIG in der 1.R gleichmäßig verteilt 6 M abn = 23 M. Abketten. Das Stirnband in der hinteren Mitte zusammennähen. Bonjour, merci pour vos magnifiques patrons. Je réalise présentement le modèle 157-15 , j’ai montré le cou à 138 mailles maintenant je dois augmenter de 24 mailles ce qui donne une augmentation au 5,75 mailles. Alors j’augmente à la 5ième et 6ième ou seulement à la 6ième mailles? Merci beaucoup! Bonjour Mme Bourrassa, augmentez après alternativement chaque 5ème et chaque 6ème m, mais veillez à bien vérifier votre nombre de mailles - voir aussi ici. Bon tricot! Buonasera Germana. Abbiamo corretto il testo. La ringraziamo per la segnalazione. Buon lavoro! Lieber Frau Amurtiger, wenn mann 1 Kraus Rippe hin und zurück strickt, muss man 2 Reihe rechts stricken (1 Hinreiche rechts + 1 Rückreihe rechts). Viel Spaß beim stricken! 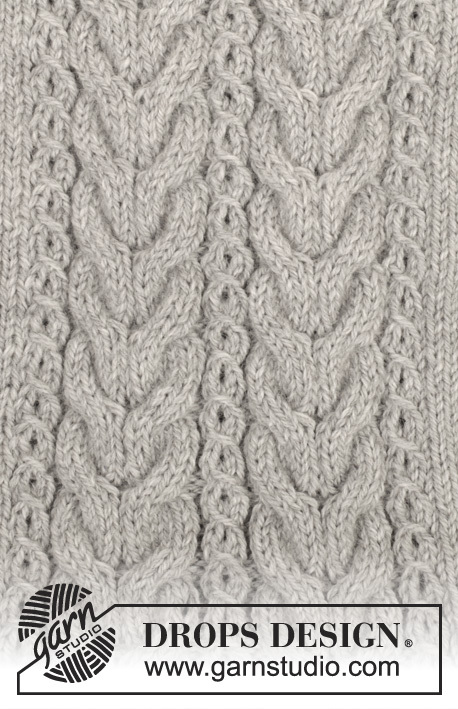 Please help, I am trying to do the poncho & when I do increases the pattern does not describe how to work the additional stitches that fall into the cable pattern. 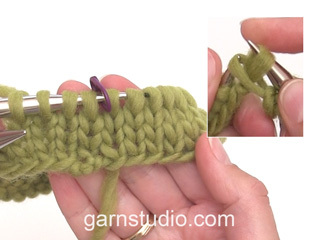 Am I just to do increases around the cable patterns so that it does not interfere with the cable pattern? 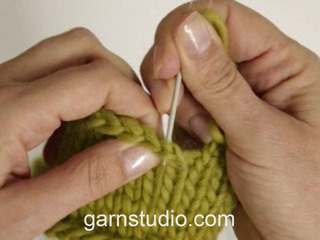 Or do I work the increases into the cable pattern which will adjust the overall look of the garment? Please help. I am lost with this pattern as it does not provide much detail with the poncho. 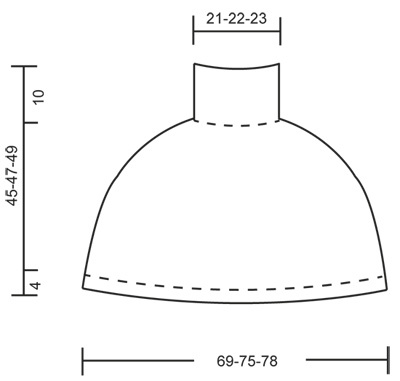 Dear Eurydice, inc for poncho are worked on either side of (P1,K3,P1) worked a total of 4 times in the round as raglan lines, work the inc sts in stocking st, so that inc will be worked before or after cable patterns and will not interfere the patterns. Happy knitting! I made the headband but it did not come out the same as it is pictured on your site. I would like to know if I am suppose to work charts A.1 and A.2 front and back from starting with row 1-8 for A.2 and 1-4 for A.1? If so, I am also to work chart A.1 repeatedly over chart A.2? Please help. Dear Eurydice, when working the headband, you'll work the diagrams on same row, ie: K 2, P 1, A.1 (= 3 sts), P 2, A.2 (= 13 sts), P 2, A.1, P 1, K 2. 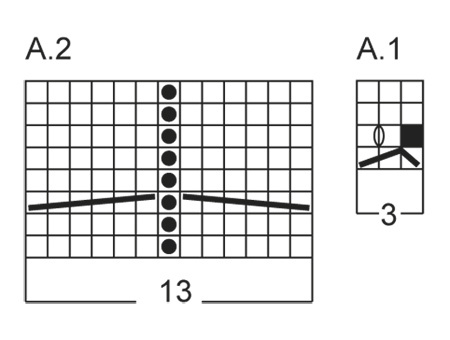 When A.1 has been worked 1 time in height, repeat A.1 from row 1. When A.2 has been worked 1 time in height you have worked 2 repeats of A.1 in height. Happy knitting! Also, for the poncho when doing the increases the pattern does not describe or detail how to work the additional stitches that fall into the cable pattern. 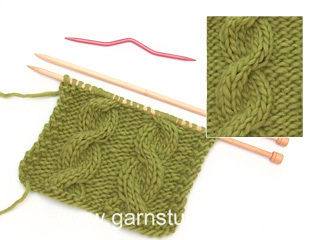 Am I just to do increases around the cable patterns so that it does not interfere with the cable? 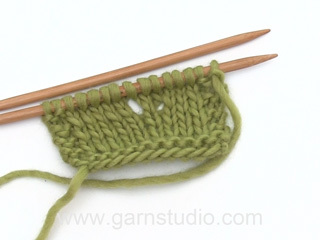 Or do I work the increases into the cable pattern which will adjust the overall look of the garment? Please help. I am lost with this pattern as it does not provide much detail with the poncho. Dear Eurydice, you are working ( P 1, K 3, P 1) a total of 4 times in the round (like raglan lines), and the inc have to be worked on either side of these sts: inc, P1,K3,P1, inc. Inc will not affect the cable patterns. Happy knitting! Grazie mille, ci proverò. Gentilissimi! Buonasera. Vorrei provare a fare il poncho ma mi chiedevo se fosse possibile farne un maglione....se gli aumenti per le raglan fossero ogni due ferri e lavorassi tutto insieme fino al raggiungimento degli scalfi (misurandolo addosso) poi sospenderei le maglie per le maniche e continuassi col corpo, secondo voi farei in modo corretto? Finora top down ho lavorato solo golfini per bambini quindi per adulto sarebbe la prima volta...grazie per la disponibilità e i bellissimi modelli! Buonasera Deborah, purtroppo non possiamo modificare i modelli a seguito delle vostre richieste, l'unico consiglio che possiamo darle è quello di provare il capo e adattarlo durante il lavoro mentre lo lavora. Può anche rivolgersi al suo rivenditore DROPS di fiducia per un consiglio più personalizzato. Buon lavoro! Bonjour Jojo, c'est exact, vous tricotez 1 tour avec 8 augmentations et 2 tours sans augmentations, vous répétez ces 3 tours 16-17 fois au total (cf taille), après 8 tours d'augmentations x 8 augmentations, vous avez augmenté 64 mailles au total. Bon tricot! Bonjour Johanna, les augmentations après la côte mousse (à 10 cm), se font sur toutes les mailles du tour - voir ici comment les répartir. Augmentez ensuite avant et après chacune des 4 sections tricotées (1 m env, 3 m end, 1 m env) = 8 augmentations. Bon tricot!